In this article we look at how to market your business with brochures in a digital age? While it may be perceived that websites have taken over, and the necessity for a company brochure is no longer what it was, brochures should still form part of your marketing strategy. In the digital age we now live in, it is time to rethink your brochure design. Treat it more as a high quality, glossy takeaway rather than a catalogue of information. Your company brochure should be packed with imagery and printed to a high specification. Your website should contain all the information a potential customer needs to know. It is always good practice to have your company brochure professionally designed and printed. You need to ensure it is high quality and portrays your company in the way you want it to. Let’s take a look at some of the ways you can rethink your company brochure. You need to ensure it makes the greatest impact on your potential customers. Your company brochure will no longer act as a standalone marketing method. It can be integrated with your digital marketing, especially your website and social media channels. It is important that your website and social media channels feature prominently on your brochure. You need to tell your potential customers where they can find more information. What can help your brochure stand out and ensure you are getting a good return? It would be helpful to offer an offline incentive via your brochure. This can a discount which can redeemed when an order is placed. It can be traced back to your printed material, so you can measure its effectiveness. When it comes to brochure design there is no one size fits all option. When it comes to the design of your brochure think about your target audience and the nature of your business. This will help you determine the size and design that is best suited to your company brochure. An A4 layout is more traditional and can give the feel of a glossy magazine or annual report. This larger size also offers a good landscape to make the most of typography and high-quality imagery. It gives you plenty of space to convey your key messages. Many companies are favouring smaller A5 size brochures. This is is because of their handy portable size. They can be easily placed in a handbag, briefcase or backpack without taking up too much space. Your designer will be able to help you determine which size will work best for your brochure design. A well-designed brochure can be much more engaging than a website or any other form of digital marketing. If designed well your brochure should engage your audience immediately. From when it very first comes through their door or picked up instore. 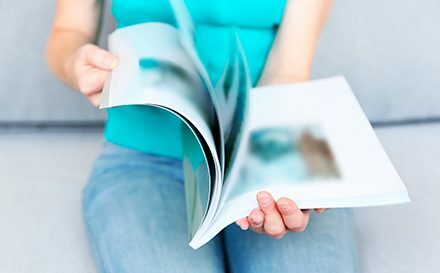 One of the biggest advantages of a company brochure is the emotional connection it can help your audience build with your brand. The tangibility of print marketing cannot be replicated in the digital world.